Thanks to the advance technology today, making friends with people around the world is no longer hard. All you need is their name or email address to find the correct Facebook Profile. It is good to know more friends as it helps me understand other culture. FB Friend request popping up because it means someone interested to know you more, get connected and stalk you privately/publicly. Some people are so scared of disclosing personal information but eager to have a Facebook account. Hence usually they will put up photo other than themselves. Such as cat, dog, fish or even birds. I don't mind if they can introduce themselves with a private message when they sent a FB friend request. I don't approve FB Friend request without proper introduction especially when their profile is private and unrecognizable, that's because I don't know you or can't recognize you through your small profile picture =) So do always remember to introduce yourself when you add someone as your Facebook friend! I know some people likes to use DSLR as a "channel" to snap photos of model (eg. KLCC PC Fair) and ask for their Facebook account. Model get pictures taken for free, more exposure for her, photographer manage to get their contacts. That's the thing that happen nowadays. However, it turns ugly if 1 out of 5000 "friends" that you've added as friend start stalking you and following you whenever you are. Not sure if you've met one but it happens to friend around me. Especially when the person is a pretty lady, their FB profile will be hacked or someone will create a fake profile and use all the photo published in their FB. Sounds familiar? 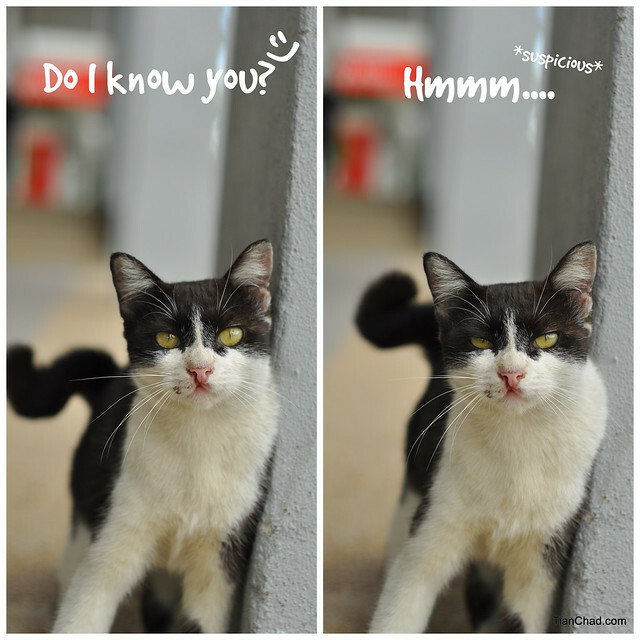 Cat Can Talk - "Hmm...Do I know you?"